Carl Zeiss of Germany is among the most renowned of the lens manufacturers. It's part of the Carl Zeiss Foundation, which also owned the Zeiss Ikon camera maker from its foundation in 1926 until it disappeared in 1972. In its long history it equipped many camera makers. 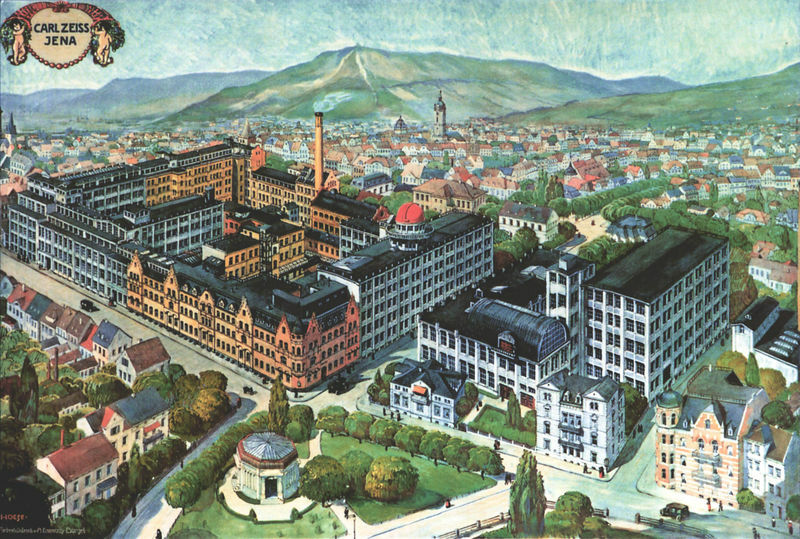 The company was founded in Jena in 1856 and called Carl Zeiss Jena. It produced microscopes and the refractometer, an optical instrument to measure the index of refraction of optical glass, developed by Carl Zeiss' partner Ernst Abbe. After Carl Zeiss' death in 1888 Abbe founded the Zeiss Foundation and built up its photographic optics branch and reduced daily working time of the company's employees to 8 hours. Carl Zeiss' scientists like Paul Rudolph created such classic lens formulae as the Tessar, Planar, Biogon, and Sonnar. Around 1900 Zeiss lenses were licensed by Bausch & Lomb (Rochester), F. Koritska (Milano), E. Krauss (Paris), E. Suter (Basle), Fritsch (Vienna) and Ross (London). That way Zeiss avoided too fast growth of its own production facilities. In 1902 Zeiss bought the camera maker Palmos A.G. and continued it as Carl Zeiss Palmos. In 1909 the camera making daughter company was merged into the ICA group which later became part of Zeiss Ikon. For example, the so called "Führerprinzip", according to which one administrative leader should have the final authority, was not implemented in full. 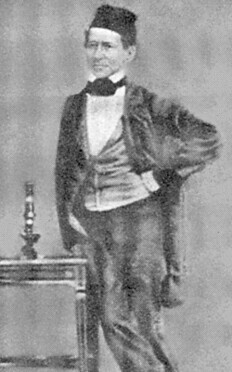 The Zeiss-board kept the authority provided for it in the company bylaws, but its decisions were to be represented to the outside by one person, August Kotthaus. On the other hand, the leadership provided clear support for the Nazi-government, including stating in a company notice that it would fire a leading employee who had rejected a personal appeal to participate in the German parlimentary elections of 1933 (where all parties outside the Nazi-party were banned). The company also provided direct economic support to the national and local Nazi-party organizations, including a "Hitler Jugend" group named after Carl Zeiss' partner "Ernst Abbe". From 1933 summer camps for Zeiss-apprentices were also coordinated with the "Ernst Abbe" Hitler Jugend group, and apprentices who were not members of the Hitler Jugend were excluded from participating. While the economy bettered, the independence of the company became restricted through the 1930s by a series of laws which e.g. limited dividends and restricting funding through market based bonds. German politics also directly or indirectly influenced the foreign trade of the Zeiss company during this period, besides protectionistic measures abroad. Exports to West-Europe and the US went down, while exports to South/Southwest-Europe, North-Europe, South America and Asia (especially China) went up. In the last part of the 1930s both China and Japan were notable importers. In total, however, exports went down from about 60% of total revenue in 1932/33 to only about 20% in 1935/36. At the same time there was a certain room for innovations, which made it possible for Zeiss to keep its quasi-monopoly status in the civil market. This includes the production of a phase-contrast microscope in 1936 and the development of both the Topogon lens for wide angle photogrammetry and T-coating (T-Belag or T-Schutz in German) in 1935. The Nazi-government also had large civil programmes to which Zeiss contributed, such as instruments supporting the construction of the "Autobahn"-highways. At the same time political projects had solid financing, and the military became the best Zeiss customer after 1933. Unlike earlier acquisitions of competitors to consolidate the market, Zeiss Jena started purchasing firms to build up a new military-technical oriented product portfolio. By keeping the military oriented companies separate, but Zeiss owned, Zeiss inteded to prevent the impression that it was primarily an armaments company, and to avoid charges of monopolization, while still coordinating orders inside the group. Zeiss Jena also provided some military equipment to other countries either directly or through licensing. For example Zeiss Jena had a secret 20-year licensing agreement regarding military instruments with Bausch & Lomb since 1921, which provided the company with more than 1 million RM from 1921-1936. According to Rolf Walter before 1933 there are, as far as is known, no noted employee files where basic personal convictions are considered regarding employment. This would be in line with Ernst Abbe's founding principle from 1896 that world-view or ideological or confessional convictions were not allowed to be considered in hiring employees, at a time when there were several jewish scientists and other workers at Zeiss. In the early 1930s there were jewish employees at all levels of Carl Zeiss Jena and at Zeiss Ikon, including the leader of the board of Zeiss Ikon, Emanuel Goldberg. However, anti-semitic attitudes were apparent even before Hitler took power in 1933. From 1933 onwards, being jewish, or in a mixed relationship with a jewish partner, were grounds for employees to be suspended. By 1937 it seems only around a dozen jewish employees were still working at Zeiss Jena, due suspensions, being moved to other Zeiss-firms, combined with ordinary or early retirement, without new jewish workers being hired. . There is proof that at least some of these, or earlier, jewish employees were later killed in concentration-camps. One of the jewish workers was Ernst Wandersleb, leader of the office for photographic calculations, with more than 20 German patents (and several US patents) in the field of objectives, filters and lenses. He was interrogated by the Gestapo in 1939, and lost his employment. He still received special technical assignments from Kotthaus and others, however, which he performed outside his old offices. Wandersleb had critized the Nazi-regime and Hitlers "Mein Kampf" and its negative characterization of other "races". Regarding race he also came into arguments with Dr. Willy Merté (a high ranking specialist, designer of e.g. Biotar, Orthometar, Biotessar, who later was picked out for work at Zeiss Oberkochen), which resulted in Wandersleb receiving a police summons and warning. Both Wandersleb and his wife survived the war, and he took up his leadership position at Zeiss Jena again after the war. In May 1939 August Kotthaus stated that Dr. Otto Eppenstein, a highly regarded scientist in the field of rangefinders with 86 German and 55 US patents, was the only jew still working at Zeiss Jena, as he had and still worked on important army instruments. Kotthaus argued with the government for his continued employment, and Eppenstein was given a "time limited" permission to continue to work by the Supreme Command of the Armed Forces (OKW). He died, seemingly of natural causes in 1942, having worked at Zeiss close up to that point. However, according to Boegehold and Wandersleb, at that point and a long time before, his name was not allowed to be mentioned in public. At work he was met with silence, and if one of his scientific papers were quoted, his name was already accompanied with a typographic dagger (used in Germany to signify people who have died). After World War II, Jena being in the Eastern part of Germany, the company split in two. One part was recreated in West Germany and based in Oberkochen, and kept within the Zeiss Foundation. The other part remained in Jena, but soon lost the right to use the traditional names, like the brand name Zeiss and the related famous lens names. In the Western countries it was known as aus Jena (means from Jena), and used obvious abbreviations, or other names reminding the past (for ex. T for Tessar, S for Sonnar). In the countries of the Eastern block, they continued to use the full names. Carl Zeiss Oberkochen made lenses for the Western Zeiss Ikon after the war, but they have also made dedicated lenses for other camera marques. They continue to do so, notably for Rollei and Hasselblad. The Zeiss lenses for the Hasselblad series of medium format SLR cameras are known for their high quality, precision tolerances, resolution, and color rendition, and have been used by many well-known photographers. From 1973, Carl Zeiss made a range of lenses with a bayonet mount for Yashica and Contax 35mm SLR cameras, in partnership with Yashica Camera Co. Ltd. The resulting Zeiss T* lenses were made both in Germany and under license in Japan, and developed a reputation for superb optical quality. Kyocera, which acquired Yashica, later partnered with Zeiss to introduce still other Zeiss T* lenses, including rangefinder and autofocus-mount models. In 2005, Kyocera ceased all camera production and discontinued the marketing of Carl Zeiss lenses. Very recently the Carl Zeiss foundation has revived the Zeiss Ikon name for a new type of rangefinder camera, with lenses designed by Carl Zeiss and manufactured by Cosina in Japan. Sony uses Zeiss lenses for its digital cameras. In 2006 Zeiss is working on a new super tele lens for Hasselblad medium format cameras. It was ordered by the Emirate of Katar and will be delivered in 2007. It consists of 15 lens elements in 13 groups and weighs 256 kg. It will be used to make pictures of fast animals in natural environment, especially the Qatari heraldic animal, the Oryx antelope. It's the biggest tele lens ever made for non-military purposes. Lenses marked Novar were three element lenses, as others used for the Zeiss Ikon camera brand it's sometimes mistaken as a Carl Zeiss lens. The Zeiss lenses of the Icarex had the names Ultron, Skoparex and Dynarex, that were originally Voigtländer trademarks. Carl Zeiss lenses and ICA cameras were imported in Japan in the 1920s by the subsidiary company Carl Zeiss Gōshi-gaisha (カールツァイス合資会社). It became Carl Zeiss K.K. (カールツァイス㈱) at some time, and imported the Zeiss Ikon cameras in the 1930s. ↑ This date is given as 1900 by Rudolph Kingslake. Ars Camera. Advertisement by Carl Zeiss in April 1922. No page number. Asahi Camera. Advertisements by Carl Zeiss in February 1930 (p.A6) and June 1932 (p.A6). Camera Club. Saishin shashinki zenshū (最新写真機全集, All on the latest cameras). Supplement to the October 1936 issue. Advertisement by Carl Zeiss on p.1. This page was last edited on 27 March 2019, at 20:41.